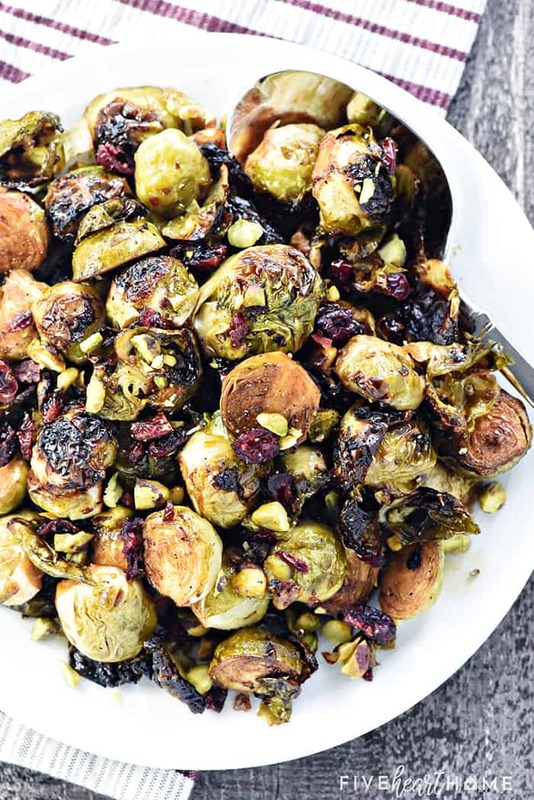 Balsamic Roasted Brussels Sprouts with Pistachios & Cranberries are crispy and addictive, for a special holiday side dish that’s also easy enough for everyday! Have you ever had a veggie so good that you pop it like candy and, before you know it, you’ve accidentally polished off the whole pan? Well, here ya go. 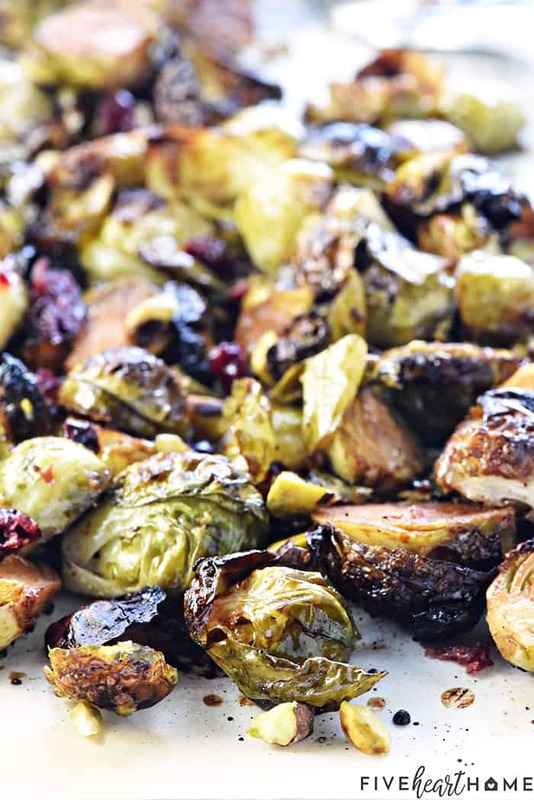 Say hello to Balsamic Roasted Brussels Sprouts with Pistachios & Cranberries! I have to admit that vegetables never constituted my favorite “food group” growing up. Luckily, over the years I’ve come up with a few methods for cooking veggies that make them so so so good that I just can’t get enough. And this gorgeous holiday (or any day!) 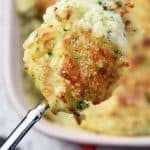 side dish just shot to the top of the list. 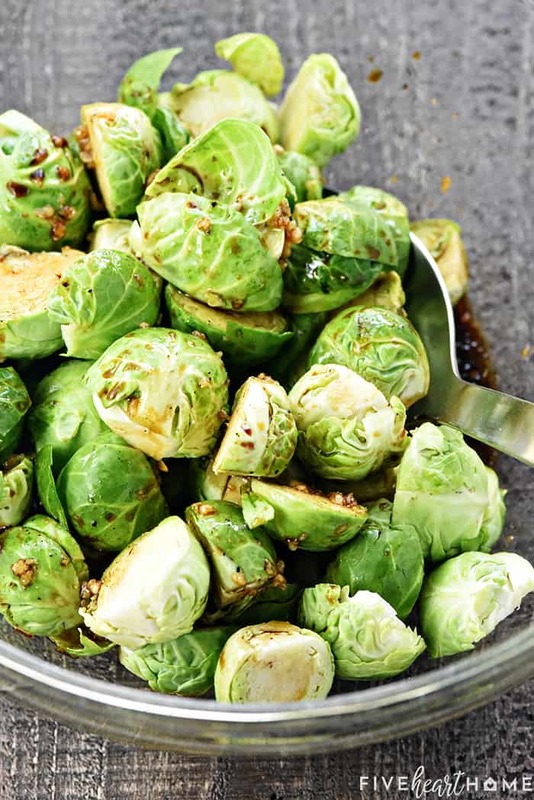 If your familiarity with Brussels sprouts extends back to those mushy, putrid globs served on a rectangular plastic cafeteria tray back in your grade school days, well, I implore you to try roasting them. They’re not even recognizable as the same vegetable, friends! In fact, I’m of the opinion that roasting is the cooking method most likely to result in the aforementioned “vegetable candy,” regardless of the vegetable. It’s certainly the case with Brussels sprouts. Roasting them renders them sweet and tender with plentiful bits of crispy, charred leaves. And with today’s recipe, the deliciousness goes even a step further. These Brussels sprouts are tossed with garlic, olive oil, salt, and pepper — ’tis true — but there’s one special ingredient that takes them over the top…balsamic vinegar! 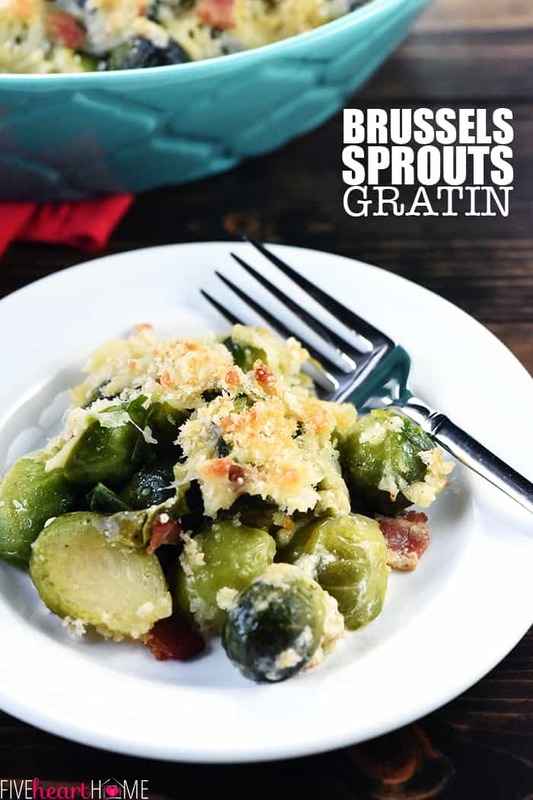 It’s whisked with those other ingredients and the resulting mixture coats the Brussels sprouts as they roast, resulting in a crisp-tender, tangy-sweet side dish that’s basically impossible to resist. The balsamic vinegar does this magical thing in the oven where it soaks into the leaves and turns all thick and sweet and syrupy. But don’t worry…it’s not too sweet! Rather, it’s the perfect balance to this mostly savory recipe. But. BUT! That’s not where it ends, y’all. 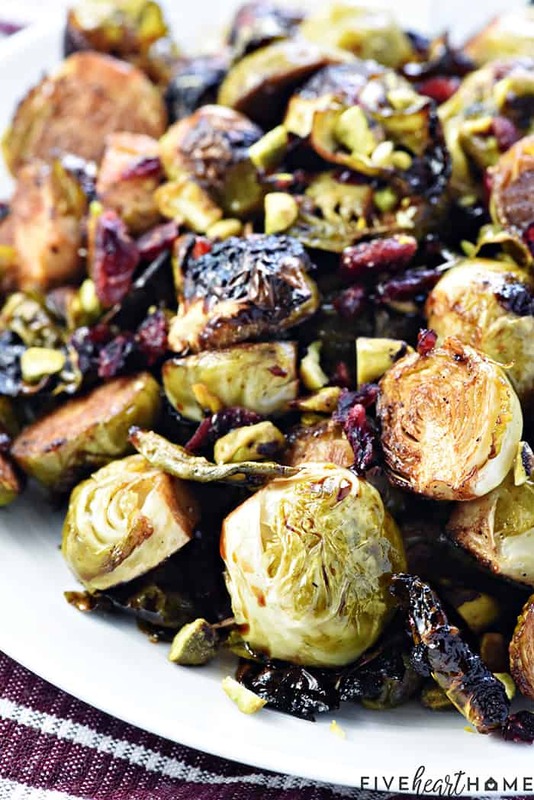 The already-glorious roasted Brussels are then drizzled with a teensy bit more balsamic before being tossed with a combo of crunchy roasted pistachios and chewy dried cranberries. The final contrast of flavors and textures is out of this world. 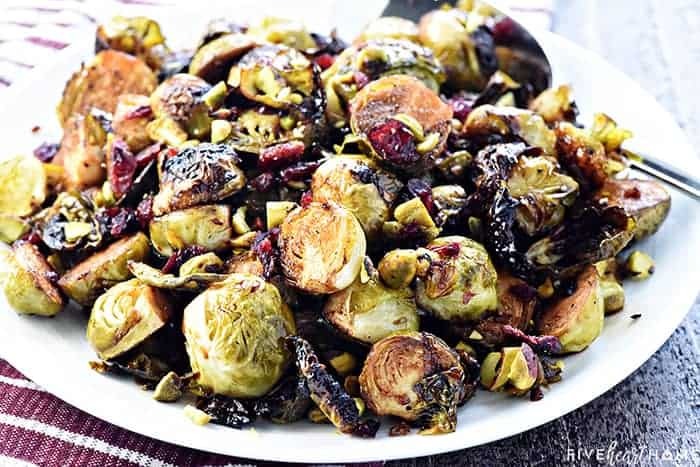 Balsamic Roasted Brussels Sprouts with Pistachios & Cranberries is an indescribably scrumptious side dish that would be the perfect addition to your holiday table. From Thanksgiving (hellooo, next week!) to Christmas (hellooo, red + green color scheme! ), it’s quick and easy to make, festive to behold, and — have I mentioned? — delicious! And back to that quick and easy thing…it really and truly is, y’all. So easy, in fact, that there’s no reason to just relegate this recipe to the holidays. 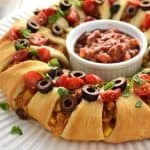 It would be a lovely addition to your menu plan for dinner parties and entertaining. 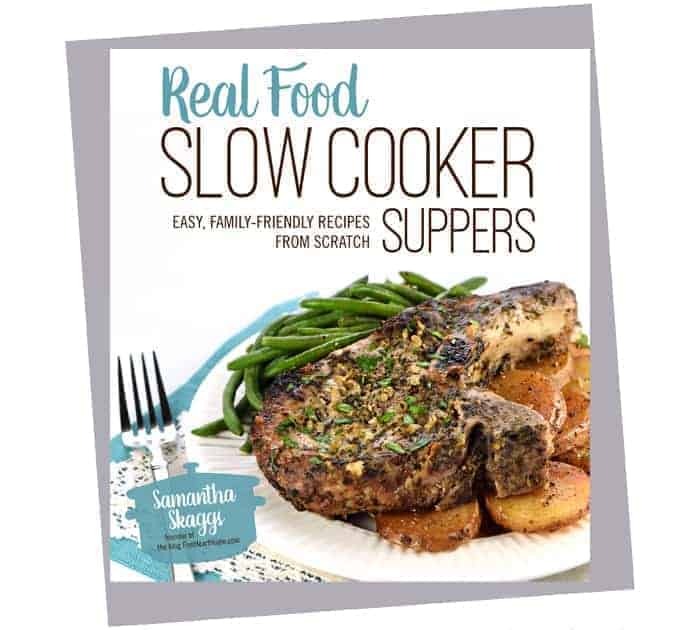 Furthermore, it would be just the culinary treat to make a regular weeknight dinner feel special! 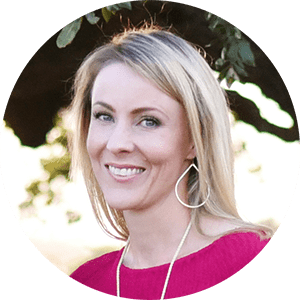 One last final bonus…IT’S HEALTHY, TOO! I’m telling you, vegetable candy is the best kind of candy. When you can’t stop eating it, there’s no guilt involved. And that’s what we call a win-win! Cook your Brussels sprouts on a large rimmed half sheet pan. Lining it with foil will make clean-up easier. And if you’re worried about sticking, you can lay a sheet of parchment paper on top of the foil. 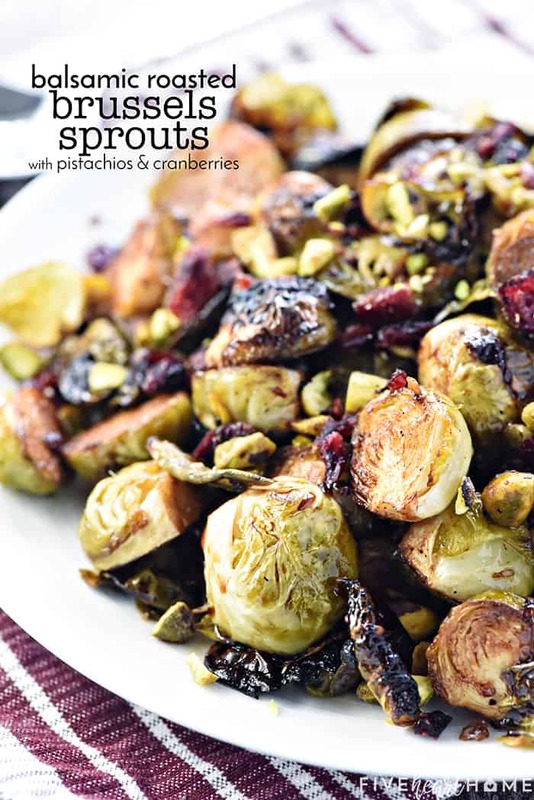 Medium-sized Brussels sprouts are recommended for this recipe. Very small Brussels sprouts probably won’t need to be sliced in half. Very large Brussels sprouts may require a longer cooking time. If you don’t have a garlic press to crush the garlic cloves, you can mince them finely and then carefully smash a bit with the side of the knife. Feel free to swap out the pistachios for another toasted nut, like chopped walnuts or pecans. Also, you may use dried cherries instead of cranberries, if you wish. 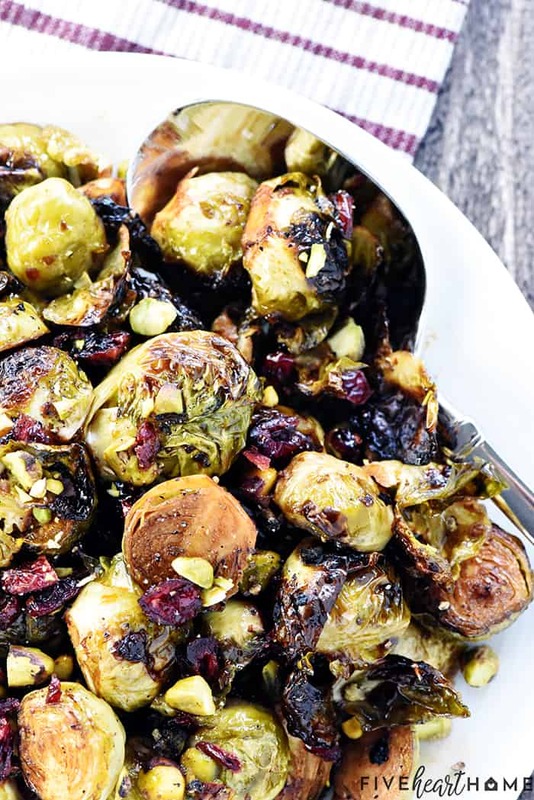 Balsamic Roasted Brussels Sprouts with Pistachios & Cranberries are crispy and addictive, for a special holiday side dish that's also easy enough for everyday! Place rack in center position of oven. Preheat oven to 450°F. Line a rimmed sheet pan with aluminum foil and, if desired, lay a sheet of parchment paper on top; set aside. 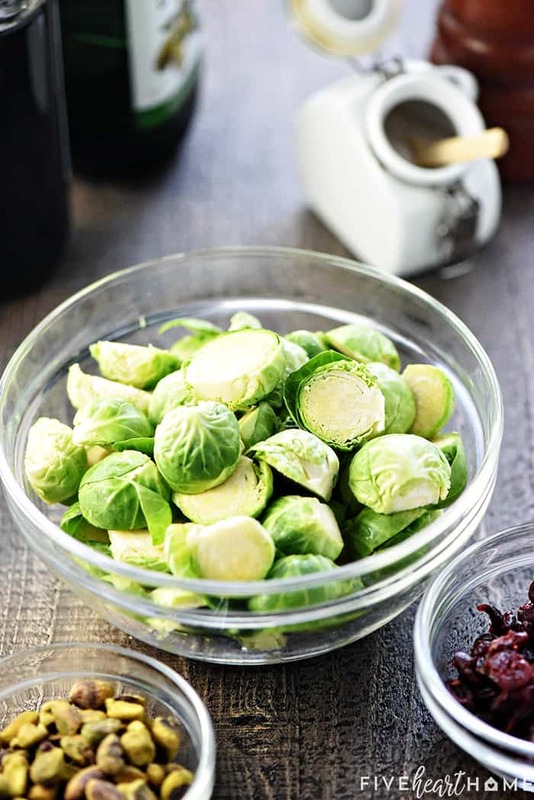 Wash the Brussels sprouts and trim each one by cutting off a small piece of the end and discarding any brown leaves; cut each sprout in half, lengthwise (except for tiny sprouts, which you may leave whole). In a large bowl, whisk together 3 tablespoons of the balsamic vinegar with all of the olive oil, crushed garlic, salt, and pepper. Add the Brussels sprouts to the bowl and gently stir to coat. 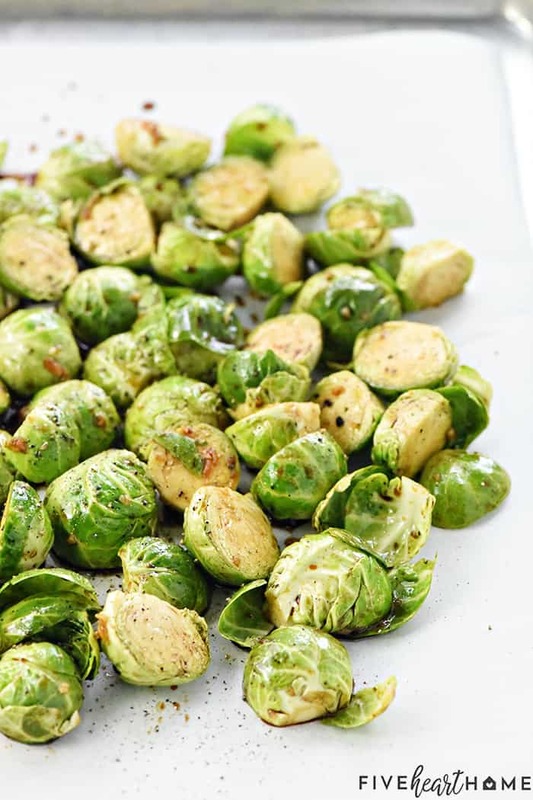 Dump the Brussels sprouts onto the prepared sheet pan and spread them into a single layer. 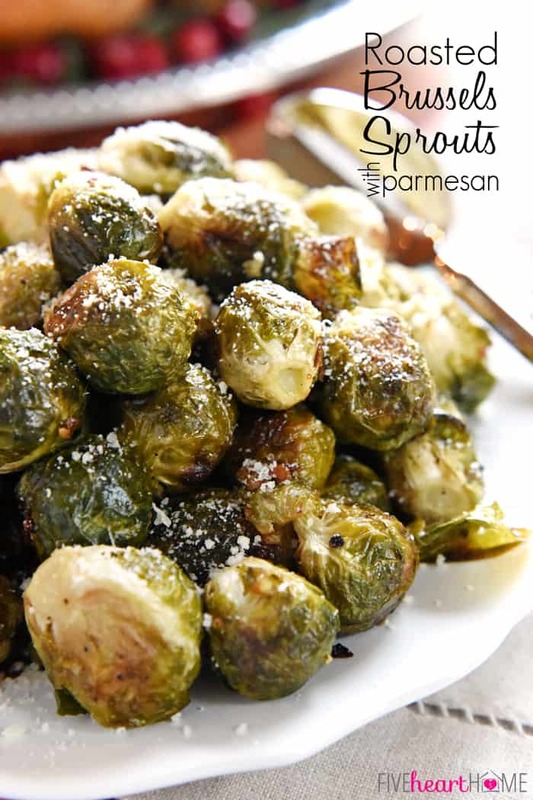 Cook for 10 minute, stir and flip over the Brussels sprouts, and then cook for 10 to 15 minutes more or until the sprouts have crispy, golden brown exteriors and tender interiors. Taste (but blow on it first...it will be hot!) and add more salt and pepper, if desired. 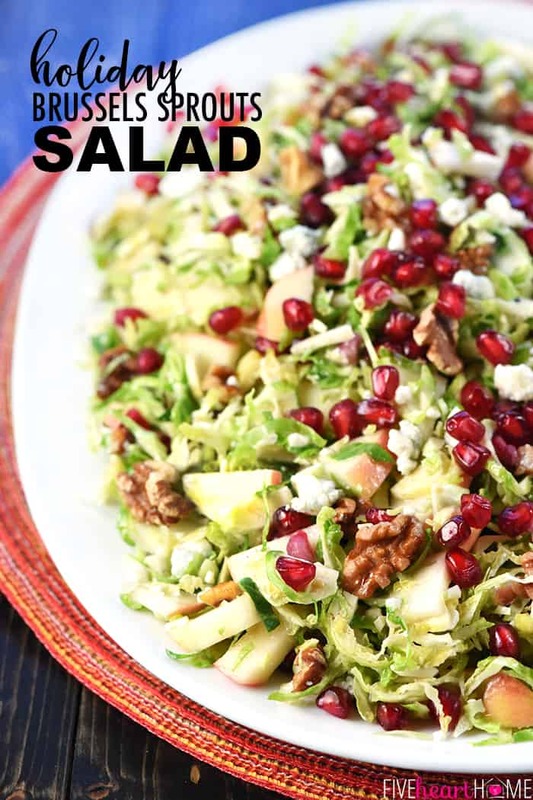 Drizzle with the remaining 1 tablespoon balsamic vinegar and sprinkle with the chopped pistachios and cranberries; gently toss to combine. Serve immediately. 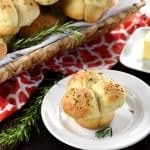 I’ve made this recipe several times for large dinner parties. It’s been a great hit. 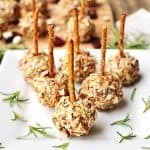 I’ve been asked to make again by guests and have shared the recipe. Making it for Thanksgiving dinner. 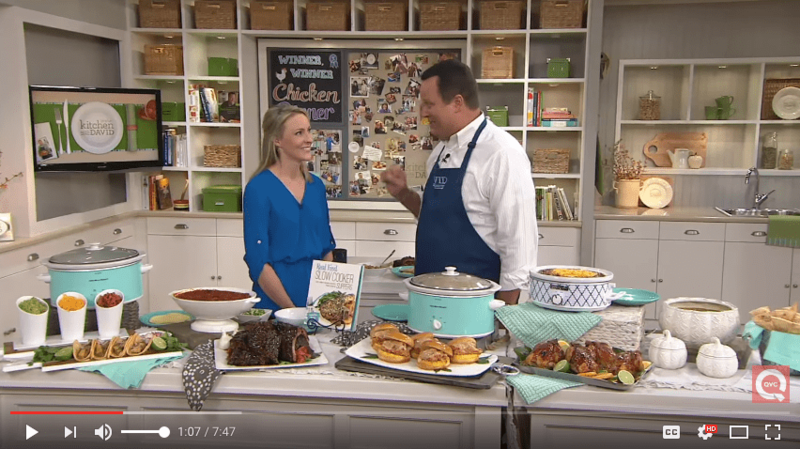 Thanks for your recipe and Happy Thanksgiving! !